Only reservations made with a major credit card will be accepted. You must inform the hotel by email at casarusticagt@hotmail.com, of what time you will arrive at the hotel. All groups will be in double, triple or quad rooms. • Internet Cafe so you can keep in touch. High speed internet terminals for Q7/hr. • Free coffee & purified water. The hotel is even better now, as we finished a complete remodel of the hotel in June 2018 and added the Hotel Casa Colibri directly across the street, as an annex to Hotel Casa Rustica. Both have the same room styles and all have access to the same great facilities. We offer 26 very comfortable & clean rooms within 2 properties next door to each other. So, depending on availability, your room will be at either one of the properties. 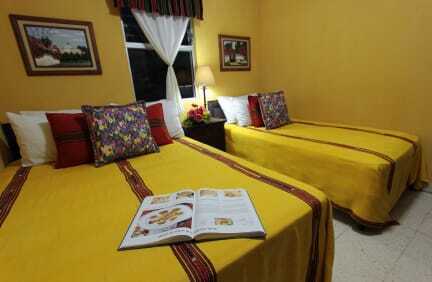 All rooms have beautiful Guatemalan typical furniture and fabrics. All rooms have cable TV, Wi-fi and new anti-stress beds. Our Quad rooms include 1 double bed & 2 single beds. Our triple rooms are either 1 double bed & 1 single bed or 3 beds. Our double rooms have either 1 double bed or 2 beds. For your convenience, we offer private airport pickups for $37. Cancellation policy: 3 days, If needed, a reservation should be cancelled 72 hrs in advance before the check in time, otherwise, you will be charged for the 1st night. Hotel accepts US dollars, Quetzales, Travellers cheques & credit cards. If paying with credit or debit card, there is a 6% surcharge. Great place! Clean and peaceful! I loved this place. Perhaps my favorite part of my visit to Antigua. The staff was friendly and very helpful, the room was clean and quite beautiful. Beware, of potential noise from the hostel next door, but I wasn't much bothered and the parties end early. We had a fantastic stay at Hotel Casa Rustica! It is right in the heart of Antigua, making it an easy walk to anything in the area! The staff were wonderful. Facilities were as described and rooms were comfortable! Absolutely clean & safe accommodations. The only thing I disliked was that it is right next to a noisy bar and on the other side is a restaurant that plays loud music. If you love the night life, this won't be a problem but if you have early morning plans, I suggest ear plugs or another location. We had our own room and a shared bathroom which was freshened up several times a day (there was constantly a fresh floor towel). Shower drained a bit slow but always hot water and free drinking water! 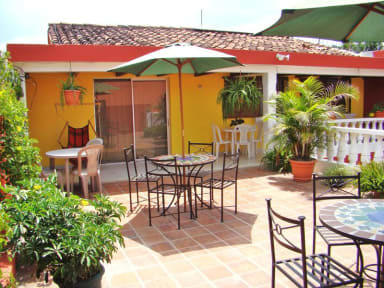 Simple accommodation yet a very good option right in the centre of Antigua. Friendly staff and a comfortable and very clean room. Recommend it. Nice, clean hostel but the music from a nearby bar was very loud, until 1am. Not the hostel's fault but I wouldn't stay here again if I had another early start! Stayed in a 6 bed dorm across the street from the main Rustica site. Room was clean, beds were fine. There were lockers for each bed, but 2 of the lockers weren't big enough for standard carryon luggage, let alone backpacker gear. Bathroom is downstairs- past a set of toilets available only for the restaurant. The music for the restaurant downstairs began playing incredibly loudly before 8 am. I wouldn't stay here again. Way too expensive for what you get. No atmosphere and very loud during the day. Very cold showers. Booked for 2nights with Casa Rustica in a double room but with no explanation were re-directed via vague emails to a partner hotel where we were placed in a twin room. The hotel we were placed in when researched ordinarily has a lower price. We were charged the amount we expected to pay at Casa Rustica.